A few weeks ago, I wrote about my Pear Vanilla Caramel Sauce class that I taught this last weekend at Lampeter Cafe (big thanks to everyone who came out and joined me). A number of you got in touch, saying that you were too far away to make the class, but would I share the recipe once the class was over? The answer to everyone who asked was, of course! I’d been planning on posting it once the class was over, because it’s such a good one for holiday gift bags and boxes. 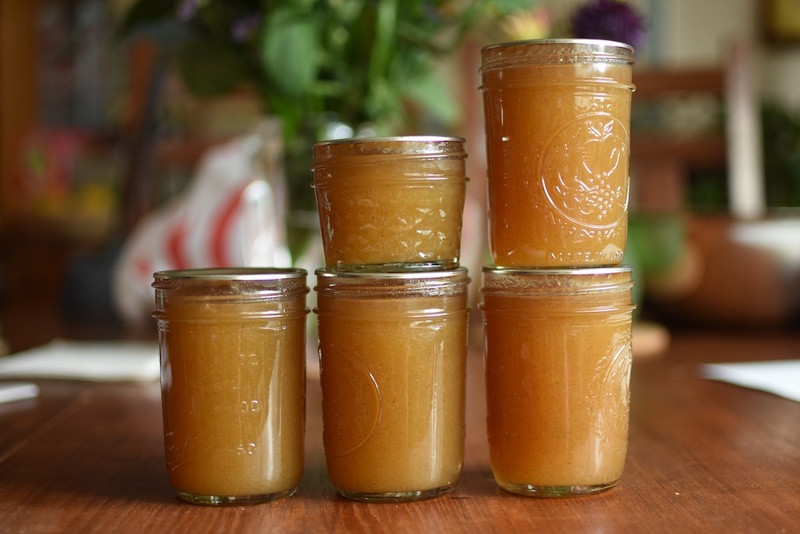 I’ve shared similar recipes in the past, but this is a particularly delicious version (there’s also a similar, smaller-scale version of this pear caramel in Preserving by the Pint). For those of you who haven’t considered such a preserve before, know that it’s delicious on ice cream, as a condiment for cheese, or as filling for cookies (this works best when you’ve cooked it quite thick). These sauces work much the way dairy-based sauces work. You combine sugar and water and bring it to a boil. Once it has reached between 250°F and 290°F (the higher you go, the more intense the caramel flavor will be), you pour in a fruit puree and return it to a boil, stirring constantly. If you want your sauce to drizzle, take it up to around 215°F. If you want it to spread, aim for 225°F. There are two things to keep in at the front of your mind when you’re making caramel sauces. The first is that it’s important to stay aware and alert when you’re working with boiling sugar. This is not the kind of project that goes well if you’re multi-tasking. The second thing to remember is that while using an instant read thermometer is really helpful, it’s also imperative that you also trust your judgment. If the sauce looks like it’s overcooking, but the thermometer isn’t reading a particularly high temperature, trust your eyes rather than the tool. Prepare a boiling water bath canner and four half pint jars. 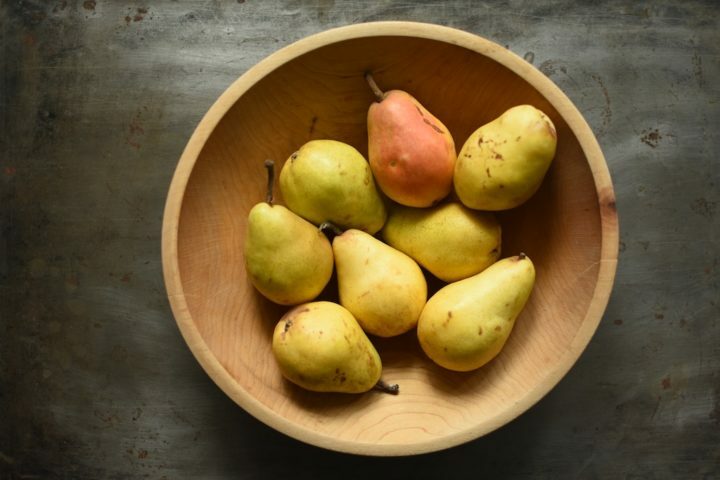 Core and chop pears. Place them in a blender with the vanilla bean paste, salt, and 1/4 cup water. Puree until smooth. You should have between 3 and 3 1/2 cups pear puree. Combine sugar with the 1 1/2 cups water in a sauce pan. 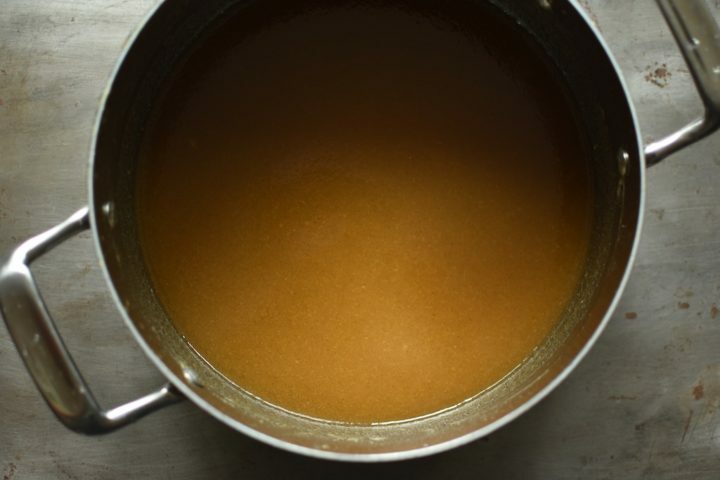 Place over medium-high heat and simmer for 15-20 minutes, until the sugar reaches between 250°F and 290°F and darkens to the color of an old copper penny (the higher the temp, the more assertive the caramel flavor). Do not stir the cooking syrup. Instead hold the handle and gently swirl the pot to move things around. Once the syrup has reached your desired temperature, remove the pot from the heat and stir in the pear puree. It will bubble and spatter, so take care. Stir puree into the sugar and return the pot to the heat. Continue stirring and cooking, until the pear caramel sauce reaches between 215°F and 225°F (the higher the temp, the thicker the finished texture will be). As you stir, take care to really work the bottom of the pot, so that the caramel doesn't stick and burn. Remove caramel from heat and funnel into prepared jars. Wipe rims, apply lids and rings, and process in a boiling water bath canner for 10 minutes. would this work with apples as well instead of pears? have an overload of apples! 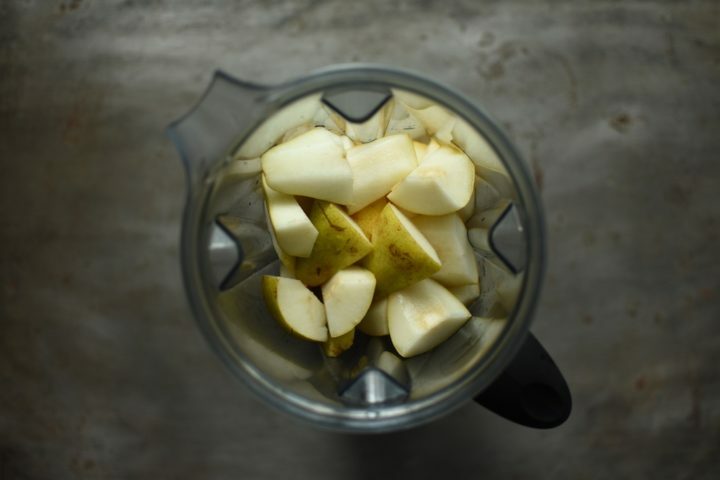 You can certainly do this with apples, but you’ll want to cook the apples down into sauce rather than pureeing them raw. I really like the Nielsen Massey brand. It is of very good quality and is consistently goo. Could I double this in one batch or should I make two batches? You could double this if you use a really roomy pot. Just be aware that cooking times might lengthen a little. Would you be able to post the metric weights if the ingredients for this please? Google offers really reliable conversion tools. Just search for pounds to grams, or cups to liters and plug in the amounts that need conversion. I’m making this today. A couple of items. You mention peeling the pears but in your picture they are not peeled. Is this because you are using the vitamix and it is a high power blender making peeling unnecessary? Second item in step 4, second paragraph I think you mean return vs reduce. Thanks for the recipe. It sounds delicious. Thank you for catching my typos. Also, I actually rarely peel the pears for this recipe, so it’s perfectly fine to skip that step. I made two batches of this today and did not peel pears since I blended the pears in my Vitamix. It turned out wonderful. I only got three 1/2 pints from each batch plus a little extra for us to eat this week on ice cream. No one’s complaining about that 🙂 Thanks for a wonderful recipe. This will make great holiday gifts. Thanks for the awesome one. I don’t have a blender, but my food processor is pretty great. Would it be okay to attempt the pear purée in there? You can certainly try it. Just keep working it until it is totally smooth. Help I did not read and combined purée w sugar- double batch! What can I do? I Love Pearls and Caramel, so thus recipe might be Perfect for me. I also the Vitamix and it is Not necessary to Peel the fruits..
Made a double batch today only we used Woodchuck Cider Pearsecco instead of the water. This recipe is very forgiving. We doubled the ingredients, but forgot to double the liquid mixed with the sugar until our caramel was starting to color. We very slowly added an additional 1.5 cups of pearsecco to the bubbling mixture. And nothing bad happened! We continued cooking until it reached 285 degrees and added the pear puree. and continued cooking til 220 degrees. We were greatly relieved when it worked in spite of our big mistake. We used an 8 qt pan for the double batch. Next time I will use less vanilla paste. Ours is very vanilla-forward. The double batch made 10 half pints. We canned 9 jars had served some of the 10th jar over maple pudding. Perfect! This is an excellent dairy-free caramel sauce. Looking forward to experimenting with other fruits. Unfortunately, the flavor of the vanilla extract will disappear in this product (because as a alcohol-based flavoring, it is not designed for heavy boiling). It’s better to find a different flavor element (like cinnamon or cardamom) if you can’t get vanilla bean paste.